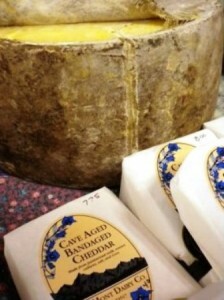 Linda Burton posting from Madison, Wisconsin – Cave Aged Bandaged Cheddar from Bleu Mont Dairy in Blue Mounds, Wisconsin sells for twenty-five dollars a pound. I bought $8.50 worth; yes, I finally found that Wisconsin cheese I’ve been looking for. 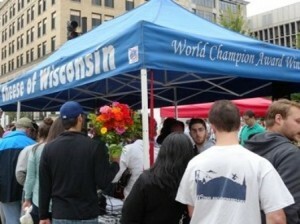 I discovered it at the Dane County Farmers’ Market last Saturday, on Capitol Square, right in the heart of downtown. I can state with almost a certainty that you’ve never been to a Farmers’ Market like this one; it claims to be the largest producers-only farmers’ market in the United States. And all those open-air tents against the background of the capitol make it without doubt the prettiest farmers’ market in the country. The DCFM has been happening since the 70’s; blue tents and white shelter as many as 300 vendors selling everything from cheeses and meats to vegetables and flowers. It happens every Saturday during the summer from 6:30 AM to 2 PM; Wednesdays too, although the weekday market doesn’t draw as many vendors, or crowds. There are just a few strict Do’s and Don’ts – it always happens, regardless of weather, that’s a Do; and all items must be produced locally by the vendor. No resale is allowed, and no pets are allowed at the market. Any vendor you see waited a long time for an invite to sell at the DCFM; the average wait is five years. The best chefs want to buy at the market, and the best producers want to sell there; DCFM producers regularly receive national and international recognition for the quality of their products. I could see that as I walked around the square; red torpedo onions shining like a work of art; bundles of garlic rowed up like pretty girls at a party; lemon scones plump with blueberries; fresh sweet corn. And award-winning cheese. I came away with cheese, and those lemon-blueberry scones; since it was nearing 2 PM, the cheeseman gave me a cucumber, free, he said, tucking it in with the cheese; the baker gave me two scones for the price of one. 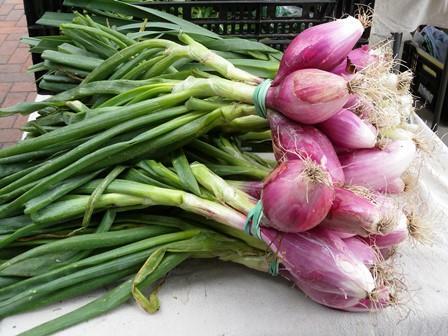 My sorrow was that I didn’t have access to a kitchen so I could take away sweet corn, green beans, yellow squash, and a bundle of those torpedo onions; I’ve never seen such onions before. I’ve never seen Cave Aged Bandaged Cheddar before either; in case you don’t know what it is, I’ll explain. “Bandaged” means it is wrapped in cheesecloth and dipped in wax before being placed in a cave to age. I read up on Bleu Mont Dairy when I got back to my room; Willi Lehner is owner; he’s a Swiss-American cheesemaker and has a sure enough “aging cave” built into the landscape at the farm. Using Alpine cheesemaking techniques, he uses raw, organic milk from pastured cows for the Bandaged Cheddar he makes, as well as Gouda, Farmstead Käse, Driftless Select “Earth Schmier,” Irish Gems, and (cute name) Lil’ Will’s Big Cheese. 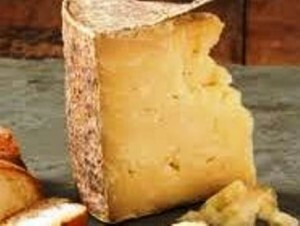 The cheddar I bought had a rich, nutty flavor, strong in taste; firm, and crumbly; that denotes age. I liked it. Cheddar accounts for a large percentage of the cheese made in Wisconsin, and Wisconsin leads the country in cheddar production; it’s been made here since the mid 1800s. Cheese marketers promote cheddar by saying it “goes well with apples, pears, onions, tomatoes, red wines, pale ales, and stout beers;” and of course it has an honored place atop a baked potato, or a warm slice of apple pie. All cheddar produced in Wisconsin has a grade stamp on the wax, or carton. “This cheese came from a farm sitting atop a ridge overlooking Blue Mound State Park in the picturesque driftless region of southern Wisconsin and was aged in an underground curing cave,” I said to the cats, grinning as I enjoyed my snack, which included slices of cool cucumber from the same farm. 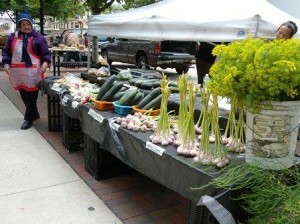 But Bleu Mont Dairy isn’t the only cheese vendor who sells at the Farmers’ Market. Brunkow Cheese of Wisconsin, owned by Karl and Mary Geissbuhler and Greg Schulte, and located in Darlington, Wisconsin, had a busy blue tent on the south side of the capitol; I didn’t stop there because, quite frankly, the line was too long. Brunkow Cheese of Wisconsin was built as a co-op in 1899 by a group of Wisconsin dairy farmers who wanted a market for their milk. Today, it is privately owned as a partnership and has been run by the Geissbuhler family since 1929; it is one of the oldest continuously operated cheese plants in the United States. They offer a wide variety of cheese including Cheddar, Monterey Jack, Colby and cold pack cheese spreads of Jalapeno, Garlic, Italian Herb and fresh cheddar curds; they ship anywhere and do gift boxes and baskets. The DCFM website allows you to search for vendors by category; there are over 300; I’ll tell you about just a few of them. In the Vegetables category, I found Walee and Sheng Lee Xiong; they live in Madison and grow and sell asparagus, beans, beets, bok choy, Brussels sprouts, cabbage, cantaloupe, carrots, cauliflower, sweet corn, ornamental corn, cucumbers, eggplant, garlic, gourds, greens, kohlrabi, leeks, lettuce, mushrooms, okra, onions, green onions, peas, snap peas, peppers, potatoes, radishes, spinach, winter squash, summer squash, tomatoes, turnips, watermelon, and dried beans. 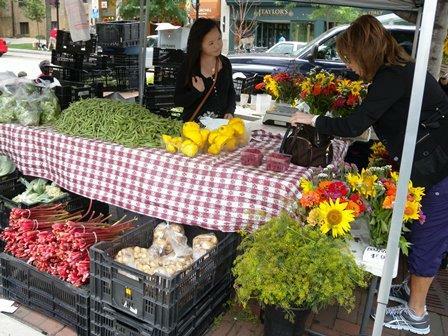 Dia Vang from Eau Claire sells most of the same, plus shelled peas, strawberries and raspberries. “We do special pricing towards the end of a market day,” advises Dia. 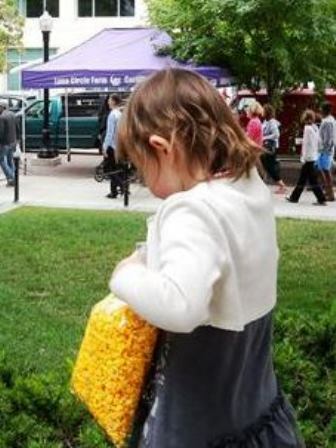 Silvan and Avis Disch from Monticello sell most of those vegetables too, plus Home Grown Gourmet Popcorn, their specialty. They have 14 varieties of popcorn; all natural sun dried. They also have parching corn, for making corn nuts. Not stopping there, they sell nuts, herb plants, fresh-cut herbs, and cut flowers, such as sunflowers, lilac, iris, lilies, and daisies. The Early Settlers Flower Farm, owned by Daniel and Janet Schmidt, specialize in heirloom flowers. They got interested when they restored a pioneer log cabin and its 80 acres of woods and wetlands; they continue to grow flowers the “old-fashioned” way, using sustainable practices with no pesticides. 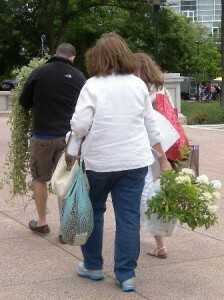 Over 85 annuals and perennials are made into cut-flower bouquets for the Market; you’ll find Sweet Williams, Canterbury Bells, Delphiniums, Farewell-to-Spring, and Kiss-Me-Over-the-Garden-Gate. I wish I could remember the name of the baker who baked the lemon-blueberry scones but oops, I don’t, and it wasn’t on the wrapper. It might have been Chris and Lori’s Bakehouse; they live in Poynette and specialize in cookies and scones; most of their business is wholesaling to grocery stores in Madison and Milwaukee. The Saturday “scene” on the Square is actually four events going on at the same time. 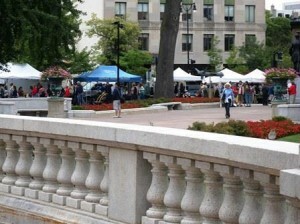 The Farmers’ Market lines the outside edge of the state capitol grounds. Arts and crafts vendors set up across the street, on city property. Non-profit, political, and public information groups are allowed to set up on the interior capitol grounds, with a permit. And street musicians play across the four streets surrounding the square. If I lived in Madison I know where I’d spend my summer Saturdays; I’d be right downtown on Capitol Square, as most Madisonians are.